Both years have display cards with a white #1 car going from right to left. Both years have "Collectors Series 1" on the upper right corner of the card. 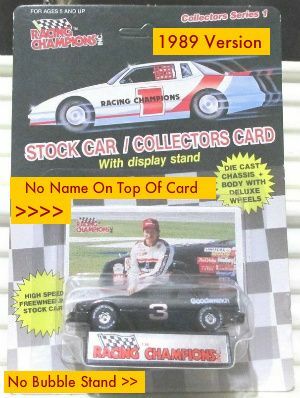 Both years have only Dale Earnhardt appearing on the back of the display card. 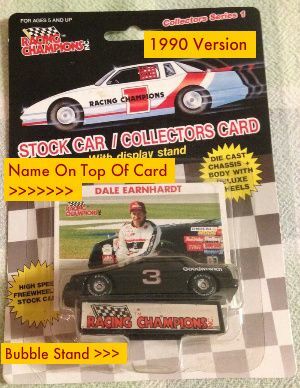 Only 1989 issues have a blister pack without a "Bubble" stand under the vehicle display in the blister and Dale Earnhardts name is not on the trading card. Both years have a red #51 car on the display card. 1991 issues may have either Dale Earnhardt or Richard Petty photos on the back. 1991 issues may have either Racing Champions/NASCAR or Property of NASCAR on the car's display stand. 1991 issue cars have a "flat" roof. 1991 and earlier cars have Racing Champions on the tires. 1992 issues have either Richard Petty or no driver photo on the back. 1992 issue cars have two "roof-rails" on the car's roof. 1992 and later cars have Goodyear Eagle on the tires.